This week’s reducing, reusing & recycling roundup | How can I recycle this? I’m a big fan of reusing milk bottles for all sorts of things and this idea for using them as stationery organisers is fantastic. 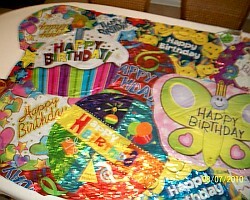 If they were for use by little delicate hands, I’d be tempted to sticky-tape the cut edges to make them less sharp. Kristin from Craft Leftovers used the offcuts from fitting a bamboo blind to make coordinating twined coasters. Jan McNeil, a Sculpture & Photography student from the University of Ulster, emailed to ask if anyone has any old baby dummies/pacifiers lying around – she wants them for an art project. Get in touch if you’ve got some – or have any ideas for where she might be able to get them from – and I’ll pass your details/suggestions along. I love the idea of this toothbrush holder made out of old toothpaste tubes. (Although I’d want to make sure it was easy to clean – which, with the lips, I’m not sure it would be in this design). This reusable lunch bag how-to uses new shower curtains but it could equally be made from a clean old one. A great way to reuse to reduce. 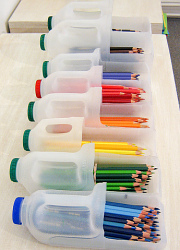 I love those plastic bottles as pencil holders the handles will make them easy to carry! Thats awesome. Milk containers like the ones in your picture are great for making scoops for gardening or giving the kids to use in their sandpit. And if they break, there’s always plenty more and the broken one can go for recycling.